Enjoy the rare "Virgin Art" edition of DEATH OF APOLLO as autographed by Mike Mayhew, without logos or cover dressing to distract from the celebrated artist's signature! This Silver Elite Signature edition is a fantastic way to commemorate this groundbreaking storyline set in official BATTLESTAR Galactica canon. 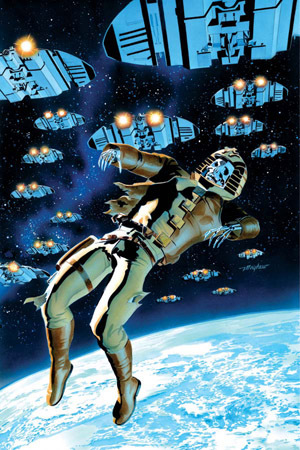 In this issue, we revisit the nomadic fleet that has been travelling for ten years, and at last, the human survivors seem to be leaving the war and the Cylons behind them. But the threats never go away. A voice from the past and a bizarre twist of fate leads Galactica into danger once again, and events will take place that will change everything, forever. A milestone in Battlestar continuity, by Guardians of the Galaxy writer Dan Abnett and cosmic superstar artist Dietrich Smith.